There are four bedrooms above the pub – three doubles and a larger ‘family’ room – all with en-suite bathrooms. 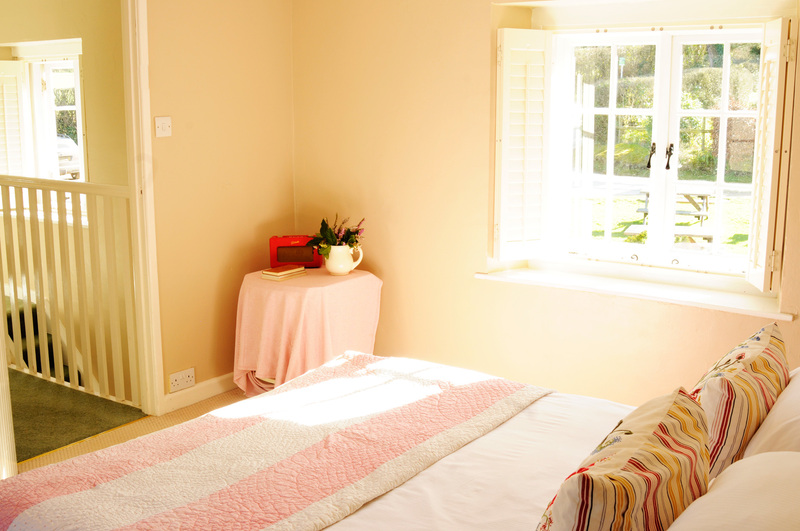 All the rooms have wonderfully comfortable beds, lovely linen, wifi and flat screen TV’s. Plum Cottage is a self-catering cottage adjacent to the pub, which sleeps up to four people. As well as one double and two single bedrooms, it has a fully equipped kitchen and a cosy sitting room with a log burner. Situated in the oldest part of the building, Room 1 – with a generously proportioned bath in the en suite and a Super King bed in the bedroom – has a wonderful, country cottage feel; low ceilings, beautiful old windows and lots of character. When you lie on the King sized bed in this wonderfully peaceful room you can bask in uninterrupted views of the beautiful Nadder Valley. The en suite features a bath with shower attachment. A large, family room, Room 3 is comprised of one double and one single bed, with room for a further Z-bed if needed. There is a shower in the bathroom. With its large window and dual aspect, Room 4 – which features a shower in the en suite – has a light and airy feel. Situated in the oldest part of the building, its low ceilings also create a cosy atmosphere on cold, winter nights. Only a few steps from the door of the pub, Plum Cottage is a lovely home from home, perfect for a one night stay or a week or two away. Ideal for families with children, but just as welcoming for a party of adults, this sweet, self-catering three bedroom cottage has a well-equipped kitchen, cosy sitting room with log burner, bathroom (with bath) and three bedrooms – one double and two small singles.